Your optimistic and forward-thinking Planet Natural blogger has always enjoyed New Year’s resolutions, especially when they pertain to our garden and landscape. And we especially enjoy learning from other gardeners’ lists. This new year, having not put much of a list together ourselves, we’ve taken a new tact. We’re resolving to do the opposite of what some gardeners are resolving to do. To note: Valerie Easton’s weekly “Natural Gardener” column in the Sunday Seattle Times Pacific NW magazine is an always- excellent source of green education and inspiration. 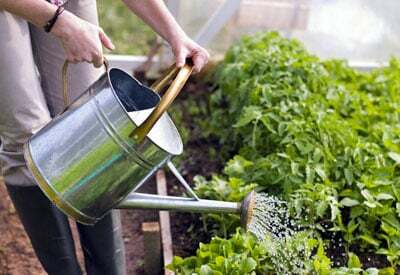 We can’t argue with the theme of her most recent installment, “Resolutions To Plant By: Look for ways to cut back in your overcrowded garden.” What gardener doesn’t want to cut back on work and resource expenditure (think “water”) when in comes to looking ahead to the coming gardening season? Easton’s resolution, and it’s a good one, is to make her garden less crowded so that it will be “easier to care for and more coherent. I’m admitting, right here and now, that I don’t have room for, and will not plant, potatoes or any more dahlias or clematis.” We can all understand and applaud her sentiment. That’s right. In 2016, we intend to plant more broccoli and many other vegetables as well. And we intend to crowd them together as best we can without discouraging growth or encouraging pests and disease. We’ve heard others say that growing vegetables can be a waste of time and energy now that so much good, organic produce (in fairness, I’m sure Easton has never thought any gardening activity is a waste of time). And supporting our local growers is certainly a worthy expenditure of effort and money. Now we have nothing against flowers and intend to plant more of them as well. And we’ll still be frequenting our local farmers market. But the rewards of vegetable gardening — the exercise, the thrill of watching plants we’ve chosen and cared for flourish, the resulting bounty of beauty and food, the comfort derived from the knowledge that we’ve done it without pesticides and other chemicals–are things we don’t get from buying produce, no matter how it’s grown. As far as broccoli goes, we’ve never considered it to take up much space at all, especially when we figure in how far past the harvest of the central head it can produce tender, delicious side shoots. Our modest planting of three plants this year yielded side shoots for stir-fries and fresh eating well past several nights of hard frost. Our Thanksgiving guests were delighted to find small, delicate broccoli heads decorating our fresh, green, holiday salad. So we resolve to plant a bigger garden this year, knowing full well we’ll be buying vegetables, at different times, from our farmers market and local organic producers. And that’s our other New Year’s resolution for 2016: eat more vegetables.